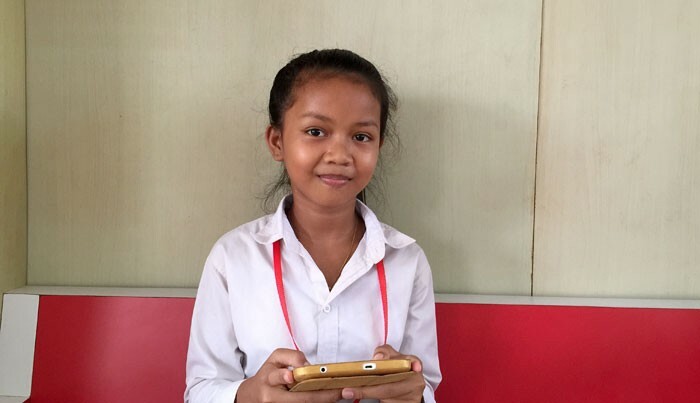 Srey Rath**,13 years old, is a student in grade 6 in Aknuwath primary school in Vealvon commune, Kampong Cham province. She lives in Sambuo Meas commune, Kampong Cham province. Her father is a farmer​ and her mother is a housewife. She has one brother and one sister. She is a second child in her family. Her sister is a student at university. Her brother is a student at a student at Aknuwath. Srey Rath is an outstanding student in class. She gets 1st level in class. She likes reading books both in tablet and books in library. She also likes reading magazines and newspapers. She said she liked reading books in Let’s Read because it has great books for educating about environment, sanitation, ​behavior which many of these books were not available in library. She said it was easy to move it and it could keep many books here in tablet without handing books from place to place. Srey Rath read books for 7 or 8 hours a week. She read books when she had free times at home, at school and outside school time. She read books to learn new vocabularies and understand meaning of the story. She always summarizes the story in her books. The title of books she likes and remember such as Sanol Bram Yang (5 wastes), The Smart student, Bun Kan Ben, Dem Kamnoen Ronteas (Lightning Origin), Daily tool, ... (over 20 books). After reading, she always shares with friends and​​​ invite their friends to the library. She suggested TAF and LFA to add more books in Let’s Read such as sanitation, Khmer culture, successful story from successful person, women books, government school, life skill, educate student out of school, poetry. And she wants TAF and LFA to update books so that it will be clearer than before. **Srey Rath is a made up name to protect the child's identity.